If you've read through a good handful of my wine reviews, you'll no doubt see that I'm a big fan of wines from Argentina. So, it's not surprising that I would also like wines from Argentina's next door neighbor, Chile. Much like Argentina's famous Malbec, Carménère grapes also originated in France. It's kind of funny how that worked out. Regardless, Carménère is another deep, dark red wine varietal to try if you've been stuck in a rut drinking mostly Cabernet Sauvignon. 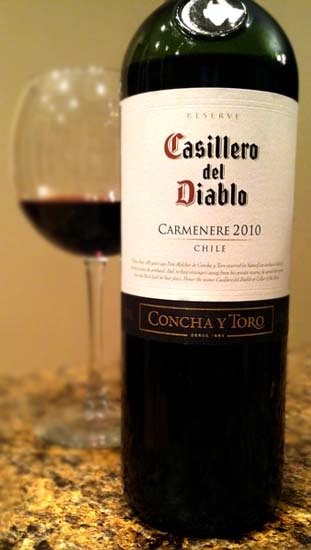 This is the 2010 Casillero del Diablo Carménère Reserve produced by Concha y Toro. Honestly, I have yet to be disappointed by a Concha y Toro wine. Could just be a fluke. Guess we'll see in future tastings. Anyway, this wine pours a richly dark garnet and has aromas of black raspberry and vanilla. Tasting brings about handfuls of plums and cranberries, coffee, moderate oak, and some fresh tobacco in the finish, with fairly mild tannins present. It is very tasty, a bit rustic, and extremely drinkable. I could easily drink too much of this in one sitting were I not being careful. Certainly I would enjoy stronger tannins, but maybe that's just me. Regardless, it's still yummy and rustic enough to keep my attention sip after sip. Drink This: if you want a reasonably priced taste of Chile (~$9). Don't Drink This: if you don't want to branch out and try something different. I love this wine! It's my every day go-to, and we can get it at Costco for $7.50 a bottle. Yummy!